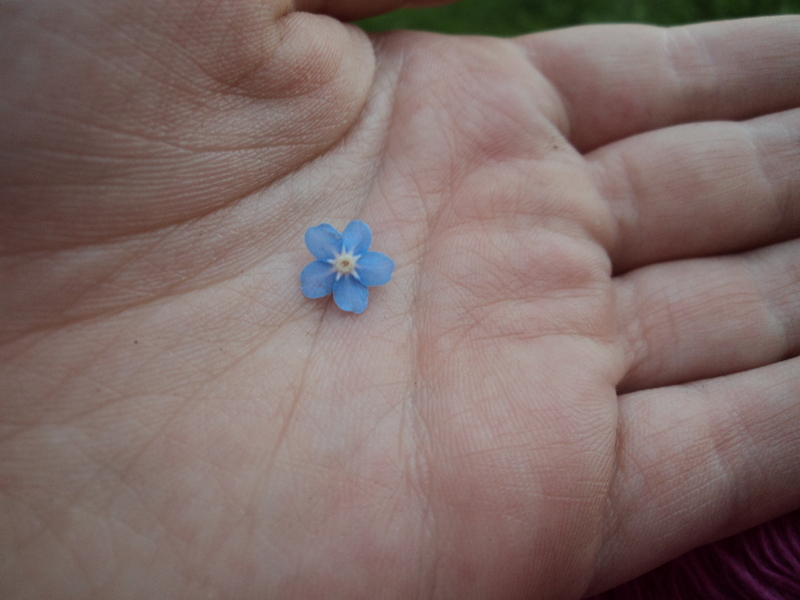 Forget-me-nots are a funny flower. Gardeners are always trying to add blue to their gardens (I am not sure why, I just know that there are a ton of magazine articles about it, and in May the entire Horticultural Society meeting was dedicated to blue perennials). Despite this, not everyone is fond of the foamy blue spring flowers. I, on the other hand, love them dearly. 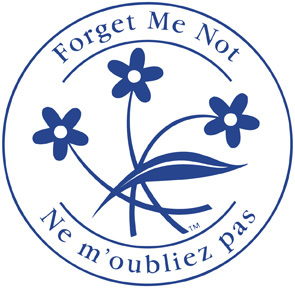 I have worked hard to get forget-me-nots established in my garden, which is ironic given their weedy tendencies. They are a self-sowing annual, and have a mind of their own. Each year after they finish blooming, they go to seed and let the wind carry to tiny specks hither and yon, into every nook and cranny of the garden. A year later, they will appear not only where they used to be but in the grass, by the compost bins, and peeking out from under the stairs. Some people find that annoying. I find it endearing. There is another reason I like forget-me-nots. They are the symbol of the Alzheimer Society of Canada. From the time my mother was in her late 50’s, she suffered from dementia. Technically it was not Alzheimers, but Lewy Body Dementia (LBD). Both are types of dementia that wreak havoc on minds and lives. The disease that my mother endured was described to me as a sort of combination of Alzheimer’s and Parkinson’s disease, involving not just memory loss but hallucinations, physical tremors and muscle spasms, too. We were always kindred spirits, my mom and I. She loved to garden and to read, just like I do. We were both terrible decision-makers and were a wreck if we ever had to go clothes shopping together. We would come home having bought almost nothing except a cup of tea. Even while my mother lost the ability to do simple things like set the table or tie her shoes or even count to three, she remembered me. She didn’t always call me by name, but I knew that she knew me. Just from the way she would greet me with a smile and settle down when I sat beside her told me that. It didn’t matter that she was miles away in her childhood, calling for people I didn’t know. We were connected somehow. I think of that now, looking out at the blue haze in my backyard. Soon the fragile petals will fade, and I will unceremoniously rip them out to make way to a few fresh annuals. But before I put them in the compost heap, I will shake them upside down and fling their seeds into garden beds, cracks and crevices. I know that next year they will be back and that is important. None of us wants to be forgotten. This entry was posted in Uncategorized and tagged family, gardening, memories, nature. Bookmark the permalink.